Walter Francis Montagu Douglas Scott, 5th Duke of Buccleuch, 7th Duke of Queensberry KG, PC FRS FRSE (25 November 1806 – 16 April 1884), styled The Honourable Charles Montagu-Scott between 1806 and 1808, Lord Eskdail between 1808 and 1812 and Earl of Dalkeith between 1812 and 1819, was a Scottish politician and nobleman. He was Lord Privy Seal 1842 to 1846. 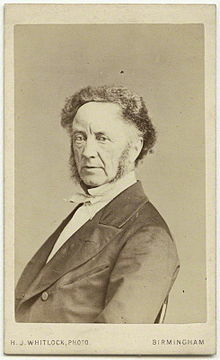 Buccleuch was born at Dalkeith House, Midlothian, Scotland, the fifth child of seven, and second son of Charles Montagu-Scott, 4th Duke of Buccleuch, and the Honourable Harriet Katherine Townshend, daughter of Thomas Townshend, 1st Viscount Sydney and Elizabeth Powys. When his older brother, George Henry, died at the age of 10 from measles, Walter became heir apparent to the Dukedoms of Buccleuch and Queensberry. He was only thirteen when he succeeded his father to the Dukedoms of Buccleuch and Queensberry in 1819. Through his grandmother, the 3rd Duchess, he also inherited the ancient northern English lordship of Bowland at this time. However, on his grandmother's death in 1827, the 5th Duke entailed the title upon his uncle, Henry James Montagu-Scott, 2nd Baron Montagu of Boughton. He was educated at Eton and St John's College, Cambridge (M.A., 1827). In June 1833 he was elected a Fellow of the Royal Society. Lord Walter Charles Montagu Douglas Scott (born 2 March 1834, died 3 March 1895): his son Walter G Leon married Alison Primrose Ralouka Heriot(1873-1935), grand daughter of Pasha Constantine Musurus. King George IV spent some days in 1822 as the Duke's guest at Dalkeith Palace, the first visit of a reigning Hanoverian monarch to Scotland. Twenty years later, Queen Victoria also honoured him with a visit. The family continued to hold a high profile in royal circles, being invited to the Coronations of William IV and Victoria, with the Duke acting as Gold Stick. Buccleuch died in Bowhill, Selkirkshire, in April 1884, aged 77, and was succeeded by his eldest son, William. He was buried in the family crypt of the Buccleuch Memorial Chapel in St. Mary's Episcopal Church, Dalkeith, Midlothian. The church is located on Dalkeith's High Street, at the entrance to Dalkeith Country Park. 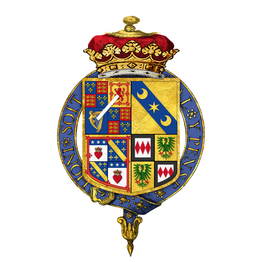 ^ "Douglas, Montague Scott Walter Francis, 5th Duke of Buccleugh and Queensbury (DGLS806MS)". A Cambridge Alumni Database. University of Cambridge. ^ "Library and Archive Catalog". The Royal Society. Retrieved 12 October 2010. ^ Blain, Rev. Michael (2007). The Canterbury Association (1848–1852): A Study of Its Members’ Connections (PDF). Christchurch: Project Canterbury. pp. 62–63. Retrieved 22 September 2012. ^ 1&1 WebsiteBuilder (30 October 2012). "Home – A WebsiteBuilder Website". Stmarysdalkeith.co.uk. Retrieved 16 November 2012. Wikimedia Commons has media related to Walter Montagu Douglas Scott, 5th Duke of Buccleuch.